I feel particularly unapologetic for the fact that my last couple of posts have had an alcoholic theme…I’ve decided to buck the trend of abstaining in January, as most of the nation appears to be doing, and instead am embracing it with renewed vigour :). It’s evident from all of the interest and support for Sweeteasy, which sold out in just 2 days, that many of you feel the same way! So, without further ado…I’m very happy to announce an exiting event that I am hosting with the Cambridge Food and Wine Society called…’Just Desserts’ on Saturday 16th February 2013 at 7.30 pm. As you may have guessed, the evening will be dessert-centric with not a savoury morsel in sight! those without a sweet tooth need not apply ! I’ve had a great time researching and concocting a menu of 7 desserts, which will be served alongside wines matched by Tom Lewis AKA Cambridge Wine Blogger. You can expect a varied selection of sweet dishes from fruity numbers and gorgeously creamy treats to indulgent chocolatey-ness (I may or may not have made that word up! :)) For more information on how to book visit the CFWS Events page and scroll down. 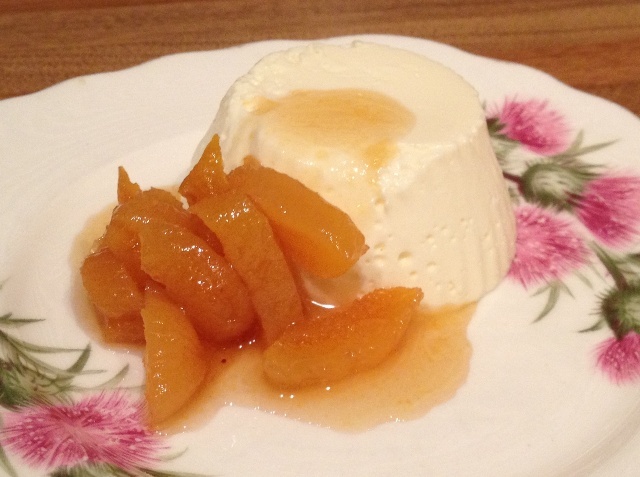 I’d always imagined that panna cotta would be tricky to make but if you follow the steps below it’s very do-able and the inclusion of yoghurt makes sure it’s not too sickly sweet and adds a lovely tanginess to the dessert. I wonder which wine Tom will come up with to match with these beauties. To begin with, put the cold water in a small bowl, sprinkle the gelatine over the surface and leave to one side to soften for 5 minutes or so. Pour the cream into a small saucepan, add the sugar and vanilla and bring the mixture to a simmer. Remove the pan from the heat and stir in the softened gelatine until it has all dissolved. In a large bowl, whisk the yogurt until it’s smooth. Then gradually whisk in the cream/gelatine mixture (if you’ve used a vanilla pod remove it now). I recommend tipping your finished mixture into a jug so that it makes it easier to pour into six ramekins. I used silicone cupcake cases, which are a bit smaller so the mixture filled 12 of these. 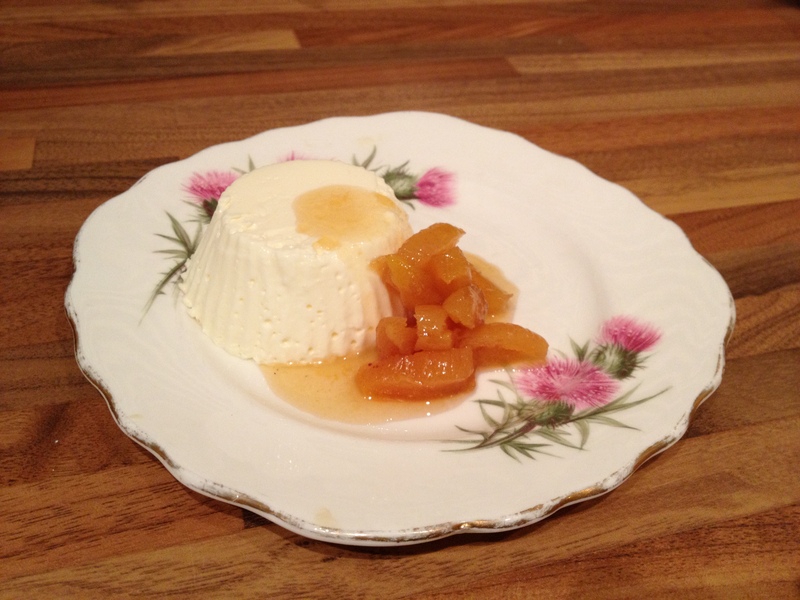 You can either let each person have two panna cotta or just keep the leftovers as a chefs treat! Sit them on a baking tray and put them carefully into the fridge for a few hours until set. To make the honey glazed apricots…put the whole dried apricots in a small saucepan with the wine and bring to a simmer. Cook over a low heat until the apricots are plump and the wine has reduced by half (about 15 minutes, but keep a close eye on them as there’s a chance that they’ll boil dry if you have the temperature up too high). Finally, stir in the honey and simmer the syrup a little more until you have a wonderful thick, sticky syrup (about 5 minutes). Leave this to cool until later. If you would like to try my version of the above along with 6 other desserts and matching wines then get booking! To book, follow the instructions here www.CambridgeFoodandWineSociety.org.uk to send a cheque or email cfwsoc@gmail.com. 2 days til it sold out? Wow. I am super excited about this event now!! And another excuse for more tasty treats? Your spoling us! Any chance you are making the desserts with vegetarian gelatine?? It sounds delicious! Hi Willow, are you joining us on Saturday? I’m afraid I’m using standard gelatin, but if you are veggie I can make an alternative. Just got the last two spaces- can’t wait! Great news! I’ll see you tonight!